SAN FRANCISCO, CA – Veteran blues vocalists Cathy Lemons and Phil Berkowitz, aka The Lucky Losers, deliver a soulful ‘60s retro sound on their third CD, Blind Spot, coming May 18 on Dirty Cat Records, distributed through CD Baby. 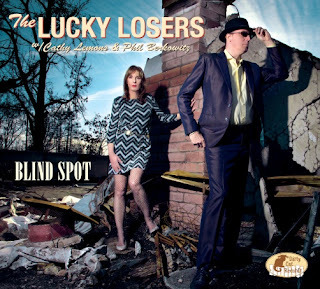 Recorded at award-winning Greaseland Studios (John Nemeth, Wee Willie Walker, Billy Price) in San Jose, California, Blind Spot continues The Lucky Losers’ long-standing relationship with acclaimed producer/engineer, Kid Andersen. Bringing back the lost art of the vocal duet, the album is solely comprised of original material created by Cathy Lemons and Phil Berkowitz alongside their illustrious and multi-talented songwriting partner, Danny Caron (Charles Brown). Blind Spot features scintillating musical contributions from six-time Blues Music Award nominated guitarist, Kid Andersen, International Bluegrass Music Association Momentum Award winning violinist Annie Staninec (Rod Stewart), 2018 BMA nominated saxophonist, Nancy Wright, and guitarist Laura Chavez (Nikki Hill), who was listed as one of the “Top 50 Sensational Female Guitarists” by Guitar Play Magazine. The Lucky Losers are hitting the road across the country to tour in support of Blind Spot Cathy Lemons - vocals/percussion; Phil Berkowitz - vocals/harmonica; Ian Lamson – guitar (who toured with Elvin Bishop and plays on the album); Robby Yamilov – bass; and Jon Otis - drums (son of the legendary Johnny Otis).